Hello everyone and welcome back to my blog! 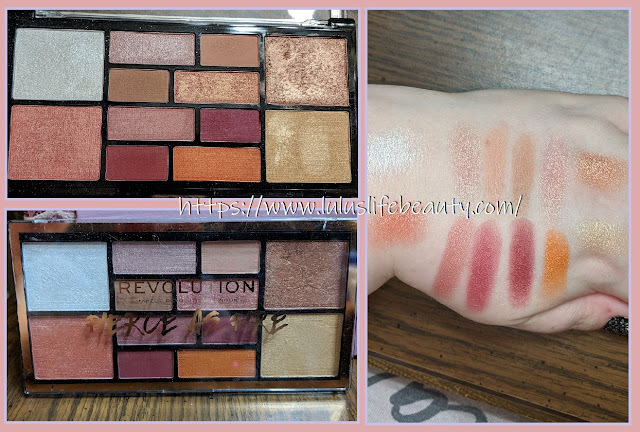 I recently made an Ulta purchase, and with said purchase if I spent $15 on Makeup Revolution products, I received their Fierce as Fire eyeshadow and highlight palette Free. I felt like this was a great opportunity to not only get a new palette, but it could make for some good content. I know they had a little bit of a bad reputation when they first came out because they were coming out with a lot of obvious dupes... I do have to say that they've made an honest name for themselves over the last year, not only that but I've liked everything by them. The quality of their products just seem to be too good for the price, but their stuff keeps getting better and better. The Review: The packaging is all plastic like their palettes normally are, and there isn't a mirror. The package is sturdy, pretty lettering and trim to match. There are 8 eye shadows and 4 highlight shades. The eye shadows have 4 shimmers and 4 matte shades. 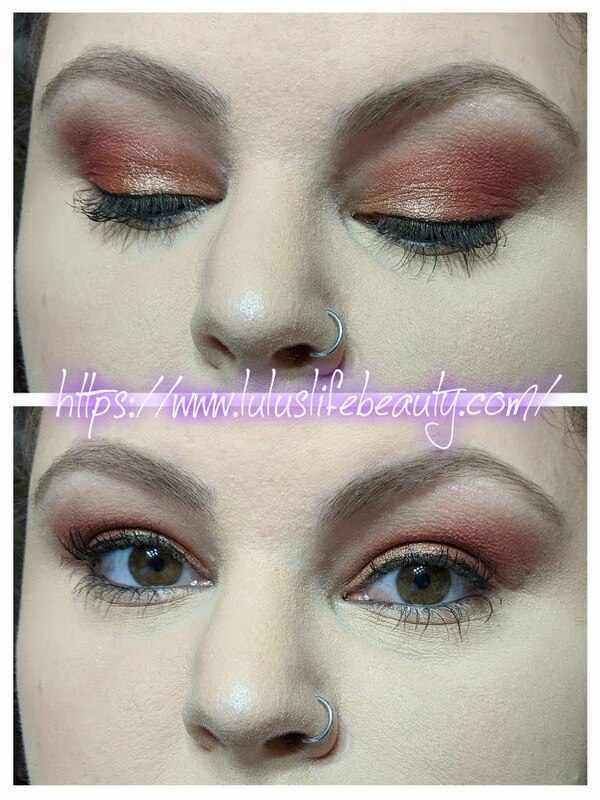 Two of the matte shades have a fine shimmer in them, but it doesn't show up on the eyes. The 4 shimmer shades are all very silky quality and shimmery. As for pigment of the shadows, everyone of them is so pigmented and smooth! The blendability is very smooth, I tested them over unset foundation to really test if they would be patchy. The shades went on buttery and pigmented, the shimmer shades are super shimmery and pigmented as well. As for the highlight shades, holy cow I was blown away with the pigmentation and creamy texture of them. They're all really shiny ad blinding as well. I was only able to test out the three shades on my cheekbones, the fourth one is too dark. It is very beautiful on the eyes though. The highlight shades are beautiful mixed as well! The palette is overall a 9/10, it would be a 10/10 if there were a mirror! 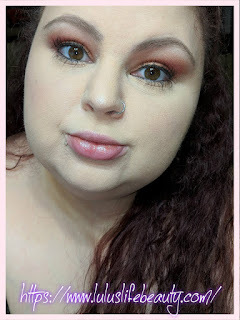 The Tutorial: Starting out this makeup look I primed my eyelids with my foundation and left it tacky to test the quality of the eye shadows. Starting out I went in with the light pinky tone and the cooler tan matte shades on a natural fiber brush and brought them through the crease and bringing the color all the way into the inner portion and above the crease. I have hooded eyes so I always bring my shadows higher than people usually do. Next to build up the outer crease area, I picked up the more red brick shade on a fluffy blending brush and went in lightly. It was super pigmented so I didn't have to add too much more than the initial dip in. I did make sure to bring that color into the inner corner as well, but very lightly just to add warmth. On the lid with a flat shader brush and some Mario Badescu rose water spray I dipped into the peachy pink shimmer shade and put it all over the inner two thirds of the lid. This color is beautiful! It's a duo chrome eyeshadow, it goes from pink to golden yellow. I used the same wet brush and picked up the darkest highlight shade and put it on the mid section of the lid gently patting out the edges. This look was finished with the lightest highlight on the brow bone and a thin line of black pen liner on the lash line. I hope you enjoyed today's makeup tutorial. I absolutely loved this palette and can't wait to see what I create next! Makeup Revolution is slowly but surely becoming my favorite makeup brand! I just got their Luxury Baking Powder in Lace and their new concealer in c3, light for neutral undertones. I've tried them roughly three times so far and I've gotta say I love their stuff more and more with each new product I get my hands on. I can't wait to try more! I'm almost at 100k views and it's all thanks to you guys and your support!